Diesel might work. I still would drill and tap some Zerks into the body, and use a grease gun filled with Diesel fuel to inject diesel into the body. I'd still leave it soak about a month filling it every day or so before I attempted to separate it again. All the skin lotion, Diesel fuel, Liquid Wrench, etc. in a bath applied to the outside of the vise body isn't going to soak in. The only access to the bore of the vise is that thin parting line between the vise body, key and barrel. If-if any penetrate can get down that crack-gap it's going to take a miracle. You can plug the hole in the barrel and fill the end of the vise with whatever liquid of choice-that should be enough. The same goes for the other end as far as that thin line of access. So you shouldn't need a gallon of what-ever. Even if anything penetrates that bore, the grip between the two moving (?) parts because of the amount of surface involved is going to be difficult to overcome. Getting the two contacting surfaces to separate a tad should help. But I'm with you. I'm stubborn too. You might heat the vise in that stove and then use a CO2 fire extinguisher and shoot the hole with CO2 to see if it would shrink the tube to loosen it. Ok, I have an idea. Do you know what an oxygen lance is for cutting steel? It is a piece of pipe hooked to the oxy regulator. A torch is used to start the cut and then the lance is brought into play. Make one on a smaller scale and you should be able to cut out the key stock for it's entire length. Do you know what an oxygen lance is for cutting steel? Jeez Mike, He's trying to SAVE this vise. Some of these guys appear to be trying to get me to act out their fantasies or something. I know, I asked for suggestions so keep them coming. So far I don't have a death wish so I think it's ok for you to keep trying. Obviously Mike has never had an up close & personal relationship with an Oxygen Lance!! Cutter, given that I've put 48000# of push on a rusted up Reese receiver to move it, much to the constirnation of the press owner, I've come to be a great believer in patience and heat, along with air hammers. There is a lot to be said for air hammers, along with appropriate striking surfaces machined to fit. I generally try to hang onto the thought it wasn't working when I got my hands on it, and all I really gotta do is NOT break it. You sure as hell ain't gonna hurt it by soaking it in diesel for a month or 2. I was looking at the photo in post #532. Do I see a hole pitted through the forging bore into the keyway? Just wondering. If I was trying to drive the movable jaw barrel, I would make a counter-bored steel cup for the jack post to fit into that was stepped down to slightly smaller than the barrel with a pilot turned on the end opposite the jack pocket that located/centered the cup. Cut a slot to clear the key. Reading your thoughts- the key is pinned so it shouldn't move? I found a 50 ton bottle jack that works horizontally so maybe you can find a loaner. Then you will have to find something to handle that much pressure to push against. 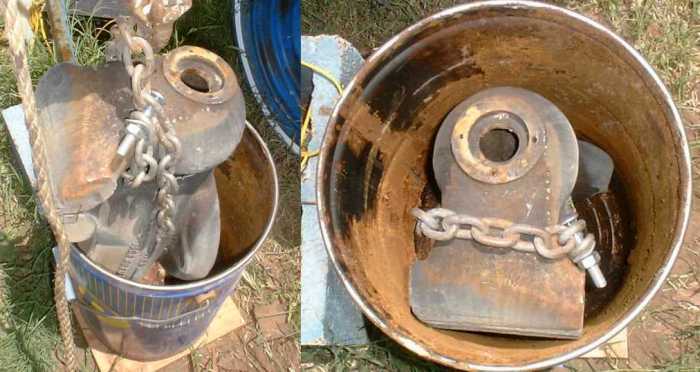 Heavier chain or heavy steel bars and cross bars all bolted together. 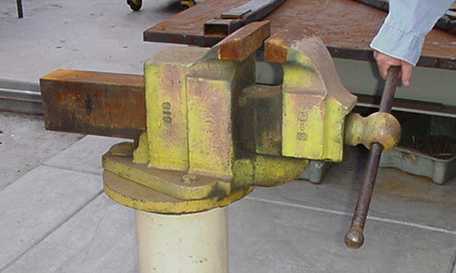 Chain or strap both the jack and the vise down to the I beam. I'd cover it like you did before and sand bag every thing but the jack handle. I know the results of squeezing a solid bar of aluminum (stop block) out of a 200 ton press. If you can blow out a broken off bolt in a cylinder head with a torch.....I have never tried it, then why can you not blow out a steel key stock in a cast iron vise? I don't think a jack is going to work. Because you're generally blowing a steel bolt out of a cast iron cylinder head. Steel burns with O/A, Cast Iron doesn't. Now, if we're going to go to the exotic, it would be relatively easy to remove the key with a wire EDM, but I don't think Cutter has one of those machines in his back yard. how about taking it to someone with an ultasonic cleanr? Yep, a wire EDM would sure do the job, but the catch is you need a hole drilled the length of the key to feed the wire through and Cutter isn't drilling any holes-yet. I don't know how thick (length of the vise key) an EDM's spools will open up for and the movable jaw is in the way anyway. There probably are some EDM machines than could hack it if it wasn't for the front end of the vise. Grumble-grumble. OK, if it wasn't for IF, cow**** would be buttermilk, and farmers would be rich. Then again, I ain't absolutely sure the key is the problem, so after Cutter removed the key we could still have a frozen vise. I saved the EDM info for a future project. I think this would be great for broken taps and studs etc. Somebody spell out "EDM"? This is all new to me. I am not gonna use it on the vise, whatever it means but I want to know about this. Here's a link that explaines it better than I can. Somehow I just never noticed this process before, maybe because I don't hang around high end machine shops. Interesting. I'll read more later, gotta get to work. fla jim got it on the EDM. Think of a band saw and instead of a saw blade a wire EDM machine uses a thin brass wire. One spool holds the new wire and a take-up spool winds up the used wire. It's kind of like MIR wire, except it doesn't melt-just gets "used" and a little ratty looking. The machine has a contact tip that passes an electrical current to the wire. The part being machined has a ground wire that completes the circuit. The wire passes through guides and the part being machined, running in the slot that the wire "cuts" by making electrical discharges to the part. It's like a minnie plasma arc that burns the metal and cuts a path for the wire. The part and the wire is submerged in a bath that cools and carries the "chips" or metal that gets discharged. Cutter, it's just like your rust removal setup with the battery charger, just fancier. We used them to make die punches and dies and very intricate parts out of steel. Really amazing machines. Internal holes, cutouts, etc. are made by first drilling a pilot hole for the feature. Then the machine operator breaks the brass wire and feeds it through the clearance hole, winds it on the take-up reel and then the feature is machined. When the process is done, the wire is cut and the machine is repositioned to make more cuts if required. The operator could set offsets on his controls to get the exact dimensions for the part being made. I wrote the programs to make the paper tapes that the machine used for it's instructions to make the complex parts. Simple circles and straight line cuts could be dialed in by the operators. What we use at work for light interference fits which is what you have (except with rust ) Is an 8 hour freeze in dry ice of both parts. Then use a rosebud to heat the outer part while pressing or pulling with porto powers. This is on shaft couplings, shaft mounted fans, back stops etc. The idea being the outer parts thermal expansion will outrun the inner part when heat is applied. Some times all it takes is a jacking bolt and an impact wrench to get the parts moving you might try this with the vise screw. I simply haven't had time to act on any of them this week. Its air conditioner season in Texas & I had a list of some 35 evaporative coolers to get serviced, repaired or replaced the last ten days. Some were easy, some took half a day. I am beat. And I am taking a few days R&R to visit a foreign country about 200 miles south of Franziland with my personal trainer and therapist. Which means I will probably still be beat when I get back. Well cutter i hpe u have a great time and get some rest!! Re the Key: On my 4.5" wilton the key is loosely rivited to the movable jaw with like 3-1/8" rivets/pins. looks pretty weak (easy to shear off), but under no load in use. Found anpther vise today it is a no.204 1/2 R Reed MFG. Co, Erie PA. Pat no.2127008, 4 1/2 wide jaws, depth from slide to the top is 3 inchs, opens to 7 inchs,4 mounthung holes,1 locking bolt on the swivel. Anyone ever heard of or saw one of theres? Well guys, I really dropped the ball on the old vise, schedule wise, meaning I didn't get the diesel bath going until this last Sunday. First of all, I had trouble coming up with an appropriately sized container; using the same garbage can just didn't appeal to me for several reasons, mainly because it seemed wasteful & kinda stoopid to have to buy 50 bucks worth of diesel for the experiment so I wanted a snugger fitting bucket. Finally I remembered having an old Zep soap can over in my barn somewhere but it took me a week to remember to get by there & find it. Then I had my little weekend R&R up in Hillaryland, got back on a Tuesday night & had to jump right back into the workworld and then yada-yada. Tempus fugits & all that. Then I couldn't remember to buy the diesel - until Sunday. So I finally got organized and hauled the old carcass out of the de-rustifying can & let it drip-dry for a couple of hours, then lowered it into its new sarcaphogas. I knew it would be a fairly tight fit but there was actually more room than it looked like at first. By the way, that's not all rust inside; most of it is dried soap. I figured it wouldn't hurt, might even help & besides I am just naturally lazy. So I left it. What I didn't really know was whether the old bucket would hold liquid. I poured a gallon or so in first & waited a few minutes to see how much seepage there might be & sure enough, a couple of drops appeared on the bottom-side seam after 5 or 6 minutes. I decided to try it anyway & filled it up until the whole thing was covered - no point in letting exposed areas re-rust while this is going on. 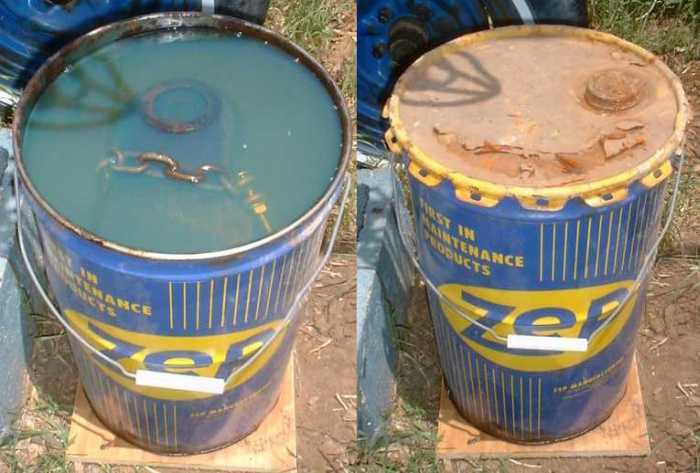 After 2 full days, the seepage still looks about the same so I guess the Zep bucket will probably hold up. I did not get around to tapping in some grease zerks a la Fla_Jim's suggestion. Maybe I will get guthered-up & do that the next weekend or two. Sure seems like a good idea. I do wonder if a grease gun will seal tightly enough to force liquid through the zerk, though. So there she sits all sealed up in the West Texas heat; yesterday reached 97 degrees according to local weather folks. We can expect a lot of that for the next few months. I suppose I might wrap the can in black plastic to boost the effect a bit. I have only noticed a reference to one other Reed vise; Rocky D posted this picture to the other board a few months back. Thanks for the update, that's very thoughtful. You obviously realize for some of us, this has become a part of our life. I want to see a working vise. The continuing saga of As The Stomach Turns, and the Vise Don't is brought to you here at Cutter's Vise by Uncle Franz Secret Products. Don't forget to order your Uncle Franz Products, such as our Secret Derusting Concentrate, and our world famous Solar Powered Laundry Drying kit. I thought the soup would be done by now. But you know, standing there looking at that vise soaking in the diesel, I can keep from wondering what would happen if I could find a plastic bucket large enough to use for electrolysis & hook the battery charger (or maybe a trickle charger) up now. What do you think that might do to the diesel oil? Cutter, we here at Uncle Franz Secret Product labritorys have electrolized many things over years of product developement, and about all diesel is good for is flushing when arc disintigrating broken tools from holes. Should you discover a new way to use diesel electricly, please don't hesitate to notify our lab via this secret web site, so we can market it. We're always looking for new profit centers. Can't do any worse than start a fire. Which reminds me of when they started using a kerosene based cutting fluid in the milling machines at work for coolant. The whole area around the machines smelled like kerosene and you can imagine what it was like with coolant pumping onto a turning mill cutter. One nice thing; the operators had the softest hands in town. Would a 10 gallon chemical drum work for a cook pot. Cut one end off. How about just going to your local walmart, target, lowes, ace , etc and buy either one of those $5 big plastic storage boxes or a plastic trash can? To remove rust and chrome use 1 part muriatic acid and 2 parts water. This brings us to the end of active posting for this thread during its first incarnation. There were several additional posts during late May to early June of 2004 but they were erased by the moderator of the old site and their authors were banned in rapid order. I think I probably saved some of them but they would serve no further purpose here. So we left the old vise soaking in its diesel bath, sitting in my back yard until the beginning of another thread, "New Shop Building". I finally had to move it to make way for the concrete crew in August of 2004 so I hoisted it out of the can & moved it to my back porch where it sat around in the way for 2 or 3 months. Sometime last November (maybe?) I lugged the Zep can into the shop and stuck the vise back in it and that's where it until last Friday, August 5, 2005. I have received quite a few inquiries over the months from folks curious to know what happened. Early on, I replied & urged them to join SFT. And of course, some of you guys have urged me to carry on with Project Wilton but backed off on account of the shop building which has become another never-ending story. Finally we posted the account of it on my website last March so I could refer folks to it and I also wanted the vise thread to be available to new members; you just never know when someone might come up with the suggestion that clicks. So now we begin again, with some improvements and after a nearly year-long soaking in the Frog Pond. I wanted to move the original threads back to the main pages of Shop Floor Talk to make it easier for anyone who wants to refer back to it and for future readers who may come across it. Maybe we'll discover the "rest of the story". I have a better feeling about it this time around and I have a couple of tools to use that I didn't have a year ago. Last edited by cutter; 08-07-2005 at 08:04 PM. Bumping it with a paw. the finale to this story can be found here as Cutter's Vise. Last edited by cutter; 10-16-2006 at 12:12 AM.